It is surprising how many creatures you can attract into your garden, just by planting suitable plants, giving you a fascinating range of creatures to watch. You will also be giving the creatures food and somewhere to live. Many of their natural habitats have been destroyed by buildings, industry and pollution. It's also surprising how many creatures you can kill and injure by not thinking before you rush out and start mowing, pruning and strimming. Please take a look at our dangers page and think before you garden. Manufacturers often state that their products are safe for other animals or all wildlife. Insecticides are highly efficient at killing the pests they are supposed to kill but may also harm other creatures. For example; slug pellets will kill slugs but may also kill hedgehogs and black beetles if they eat the poisoned slugs. Herbicides can harm worms and other creatures that live in the soil. Native plants are the ones that our native insects and other creatures feed on so they will attract more wildlife. Many of our native wild flowers are overlooked for the flashier imports but they are attractive and can easily be grown in a flower border. Native trees and shrubs can be used as an attractive hedge, providing cover for hedgehogs and other small mammals plus nesting places and roosts for birds. 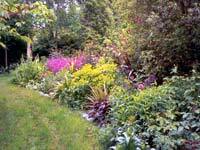 If you want the creatures to live in your garden then you need to provide them with habitats. The edge of a wood is a great habitat for many creatures because it has many layers of plants. But what if you have no room for a tree? Well how about a hedge, or climbing plants over a trellis; these can be used to create a high level. Shrubs should be grown below these and at ground level, woodland wild flowers. It is important to have dead and decaying material on the soil surface which will provide hiding places for creatures. Forest bark or leafmould can be used for this. If you leave areas of lawn uncut for a few months wildflowers and grasses will have the chance to grow. These will provide a new habitat for insects and small mammals. For a spring meadow, leave the grass uncut until the end of June. Then cut it down but before you do, please check carefully for any animals sleeping in it. We get huge numbers of casualties with strimmer injuries. After cutting leave the grass to give the seeds time to fall before raking. Rake off the hay. For the rest of the year mow as normal. For a late summer meadow keep the grass roughly cut in early summer, then leave it until late September when it should be cut and raked. Removing the dead material is needed to reduce soil fertility, which encourages wildflowers. A pond will quickly attract a huge range of creatures such as beetles, pondskaters, damselflies, frogs and toads. The pond will also provide a place for birds to bathe and drink. A pond should be in an open sunny space and the larger it is the better. However, even a small pond will attract plenty of wildlife. A wildlife pond must have some shallow edges to allow creatures to climb in and out and in one place a minimum depth of 60cm. It should also have plants around it on at least one side. Many wildflowers grow well in gaps in rocks and old walls. The gaps between the rocks are ideal homes for many insects and small animals. A pile of logs is also a good place for insects and small animals to hide and makes a surprisingly attractive addition to any garden. However, if you have open fires, please do not use your log pile for fuel; you will burn all the beneficial insects and leave the other residents homeless assuming you don't kill them whilst dismantling the pile. Flowers will attract butterflies, bees, hoverflies and other nectar and pollen feeding creatures. Once these are in your garden the birds and small animals that feed on them will follow. Berries on shrubs are another source of food. Food for birds in the winter months can be a life saver. A bird table gives birds a safe place to feed. It should be on an open site so that cats can not hide, and catch the birds. Many birds, bats and hedgehogs will use manmade boxes as a home if there is no natural home for them. These boxes can be bought or made. This site has plans for a hedgehog house. A compost heap is an ideal hiding place for many creatures. Worms, beetles and other insects that help the waste to rot can be found there as well as larger creatures such as toads and hedgehogs. Please be very careful when turning the heap over or using the contents. Hedgehogs will often sleep in them and if you stick a garden fork into the pile, you may skewer a little one causing horrific injury. Gently check through the heap before using it just to make sure that it's safe. If you can't do that then consider an enclosed bin made from pallets with plastic mesh lining the inside. Flowers such as buddleja and poached egg plant will attract butterflies, bees, hoverflies and other nectar and pollen feeding creatures. Once these are in your garden, the birds and small animals that feed on them will follow.